Furniture in Action: the new Karhu's are here! Design a modern, more open kitchen and make it more functional for a larger family, with a built-in office area. Knocking out the wall to the office allowed us to open up the space and give it a brighter, more modern and airy feeling. 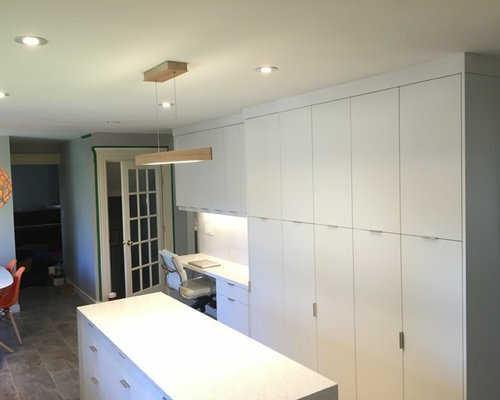 The new room was then separated into different task areas: office, kitchen, casual dining and made sure there was an easy flow from space to space. Using the same cabinetry style between the kitchen and office area gives the room a seamless look. 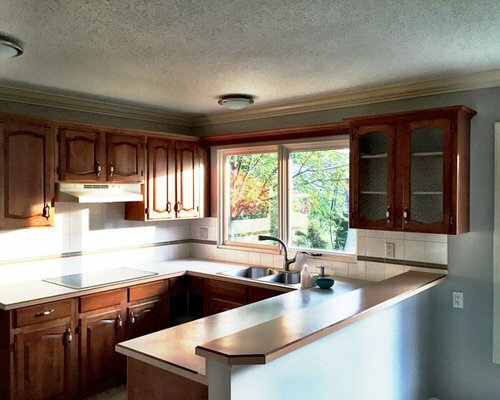 Having no upper cabinets on one wall really gives the feeling of a more open space and focuses your attention on the window. Clever storage additions allow the homeowner to stow away more appliances, keeping them off the counter, which looks great and allows for more useable space. 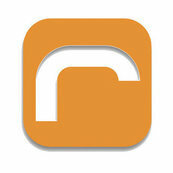 “We LOVE how it looks. It’s so much more open and bright; we are no longer bumping into each other and things are running a lot smoother now. Surprisingly, some of our favorite features are the storage solutions. I love the pull out “Euro Bin” for organizing garage and recycling, the pullout towel rack and the “Magic Corner” which maximizes storage space. And of course, Stephanie was a delight to work with and made the process fun.” says owners Sharole and Scott. 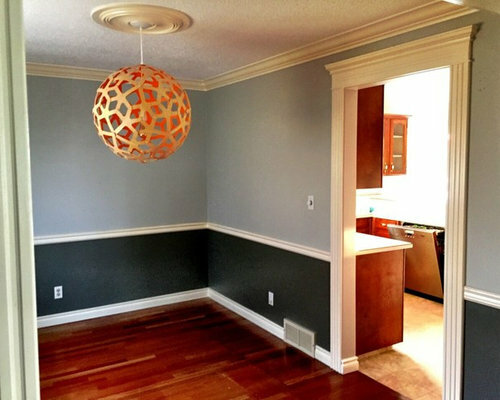 “It's a long room after the wall was taken out between the office and kitchen. We needed to make the work triangle (stove/fridge/sink) comfortable - not too may steps between each unit - but enough space that people could be at different units and not run over each other. You always lose walls (therefore storage) when you open a space. 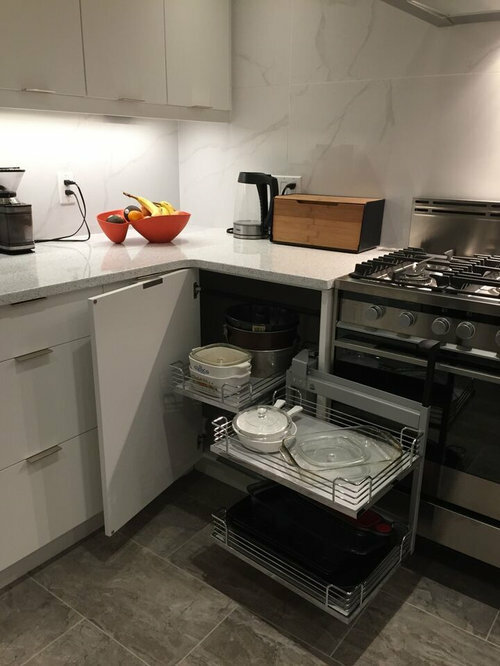 Increasing the amount of storage was a challenge, but by making the storage functionally specific for each task area of the space we made it work.” Stephanie Bennett, revolve Kitchen Designer. 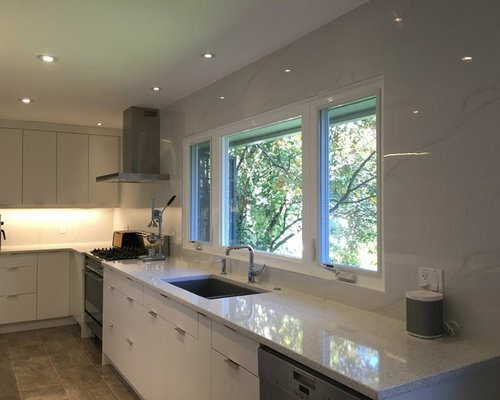 Leaving no upper cabinets on the window wall gives the room an even more open feel and draws the eye towards the window. 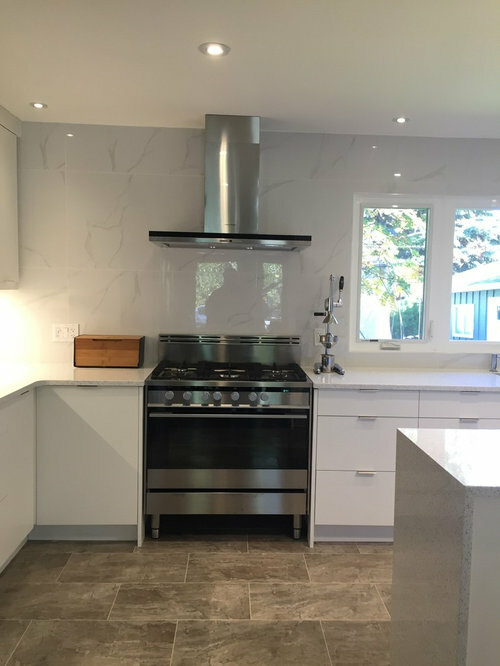 A small island was added to allow for additional counter area. Wrapping in the island in a waterfall edge quarts gives it a more upscale look. 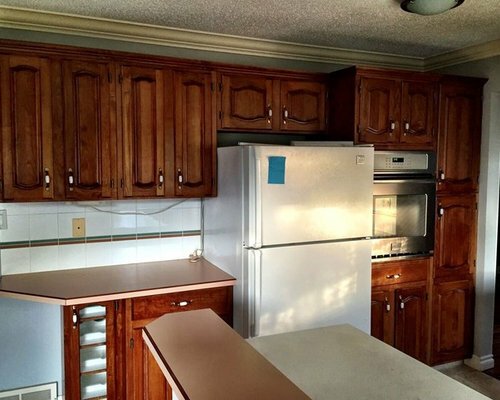 The work area and office storage area blends seamlessly with the kitchen cabinets. 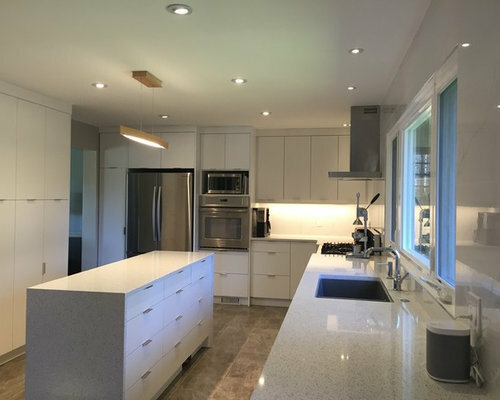 BEFORE: The objective of this kitchen redesign was to design a modern, more open kitchen and make it more functional for a larger family, with a built-in office area. BEFORE: this was the seperate office area that we merged with the kitchen to create a much larger, open space. 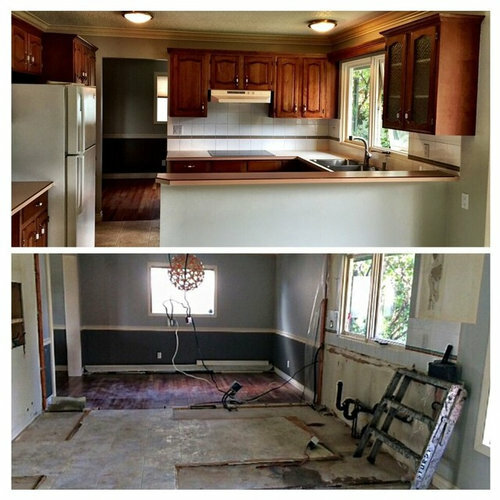 BEFORE: the bottom image shows the removal of the wall, really opening up the space. The addition of a "Magic Corner" maximizes storage within the corner cabinet and allows for easy access to even the most buried items.